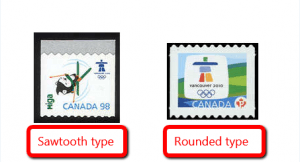 Self-adhesive stamps are usually released in booklet or coil form and are attached to a backing paper; the metal die cuts through the stamp paper while leaving the backing paper intact. This enables you to peel individual stamps off the backing paper whenever you need them, leaving the unused stamps in your booklet or coil. The die can be designed to cut out any shape of stamp-the possibilities are endless. Sometimes die-cut stamps are cut to simulate the look of traditional perforations; this is called a «serpentine» die-cut. Serpentine cuts are measured the way traditional perfs are and you can find the measurements in your stamp catalogue. Die-cut stamps can also have «straight» edges. Stamps can even be cut into fancy shapes. Some stamps have fancy cuts, straight and simulated perfs all in one stamp!! -collectors differentiate varieties of serpentine die-cut stamps one from another by their upper corners. The upper left corner marks the stamp as either a «peak type» or «valley type». what do I do with the stamps that I have collected since 1960? Use them for postage or wallpaper. Because what you have is very likely to be substantially different from what I have yours would fill holes in my collection that need filled. Therefore don’t wallpaper with them.